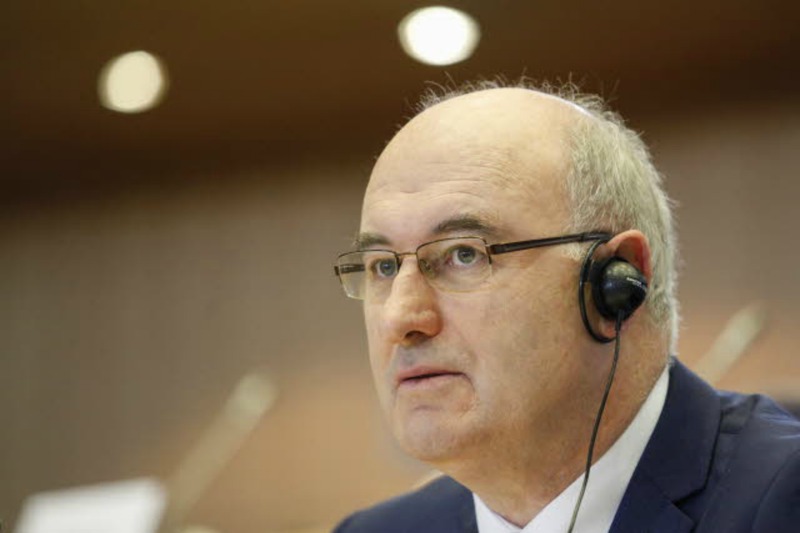 Irish Commissioner-designate for Agriculture and Rural Development Phil Hogan survived his hearing in Parliament’s AGRI Committee, in spite of attacks by the Greens, and some domestic policy issues, raised by compatriots. Hogan, who is considered one of the most experienced politicians in his native Ireland, appeared competent and calm during the hearing yesterday (2 October), occasionally displaying a sense of humour. Hours after the hearing, the agriculture committee voted resoundingly in favour of his candidacy for the Commission job. An economist by training, and a former environment minister from the centre-right Fine Gael party, Hogan reminded the Agriculture Committee of his roots. “I grew up on a farm, in rural Kilkenny”, he told MEPs, adding that he had campaigned “in favour of each and every treaty change”. As MEPs are well aware, Ireland’s constitution requires all changes to the EU treaties to be voted on at referendums, the latest one having allowed the Lisbon Treaty to enter into force. Hogan also reminded MEPs that during the 2013 Irish EU presidency, he had chaired the environment council. In his Mission letter to Hogan, Commission President Jean-Claude Juncker charged Hogan with providing ideas for the €300 billion jobs, growth and investment package to be presented within the first three months of the Commission’s mandate. Juncker asked Hogan to focus on ensuring that rural development spending is well integrated into jobs- and growth-generating investment strategies, at both national and regional levels. Another element of his assignment is to bring more flexibility, and to simplify the Common Agricultural Policy (CAP) instruments. In particular, Hogan is expected to present proposals for simplification in the areas of direct payments and in particular as regards greening, rural development, quality policy and the fruit and vegetables scheme. Hogan told MEPs he took his assignment seriously, knowing that “simplification is not always simple”. He pledged to start by screening existing legislation and based on that, see what can be simplified. After one year, Hogan explained that he would review the system of direct payments, and what arrangements could make it simpler. He added that he was aware of concerns about the greening of agriculture, but that he wanted a close check before making assessments. Hogan said that the response to the Russian food ban was the most immediate challenge. In retaliation to Western sanctions over the Ukraine crisis, Moscow imposed trade sanctions on a number of agricultural products and raw materials coming from the West, including the EU. “We have shown solidarity to the farming community. We will not hesitate to take appropriate measures,” he said. Hogan explained that as Commissioner, he would pay attention to rural development programs and make sure that agriculture benefits from research and innovation, also in the framework of the EU’s Horizon 2020 initiative. Environment and sustainability will remain central in the Union’s agriculture, he said. The Commissioner-designate also spoke about opening up business opportunities through free trade agreements. But he said that that the Transatlantic Trade and Investment Partnership (TTIP) should not lead to downward pressure on the EU’s own production standards. Hogan was attacked by Green MEPs for lacking substance on his answers on organic farming, of being vague on GMOs and for ignoring “neonicotinoids, a class of neuro-active insecticides chemically similar to nicotine, and their fatal impact on bees. A Scottish nationalist MEP asked Hogan which whisky was better – the Scottish or the Irish product. Hogan answered that he had travelled across Europe and tasted “all kinds of whiskeys”. 8 to 9 October: The Groups will meet on Wednesday 8 October in the afternoon and on Thursday 9 October in the morning in order to evaluate the hearings. Oops, an embarassing slip from your usual high standards. The Commissioner-designate for Agriculture and Rural Development is Phil Hogan, not Paul Hogan. Funny coincidence, Paul Hogan is also the name of the Australian comedian who played Crocodile Dundee.